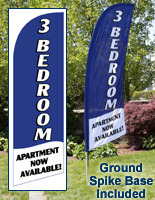 These Banners, Realtor Flags Come with Pole, Ground Spike and Carrying Bag! Several Messages to Choose From! 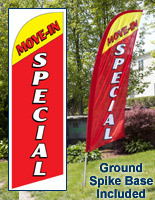 Sell Properties Faster with These Realtor Flags! Black nylon carrying bag for organized storage and portability. 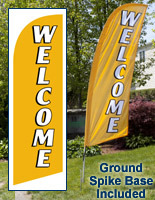 Ground spike base allows agents to post the banner in a lawn or garden. 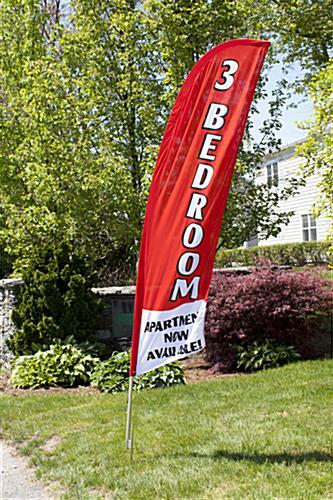 These swooper banner realtor flags have bold lettering that reads "3 BEDROOM" in bold white text on a red background. Under the vertically oriented text, "APARTMENT NOW AVAILABLE!" is printed in black font. 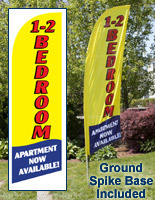 These realtor flags for 3 bedroom apartments stand 8' tall when placed on the poles, which is more than ample height to ensure passing cars can read the message from a distance. A ground spike base is included for use on any grass covered area or entrance garden. Realtor flags that are 8' high only require one person for assembly, yet are large enough to guarantee adequate exposure and visibility for the message. A four-section pole comes with this unit; (2) aluminum sections and (2) fiberglass sections. These realtor flags, also known as real estate banners, are blow and flutter in the wind as other pennants do, but are a fraction of the cost. There is a cord attaching the pennant to the pole so it does not blow off if winds increase to an above average level. 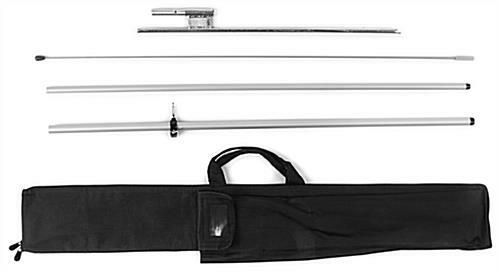 The realtor flags break down into several components for storage in the black nylon carrying bag. Many real estate agents will take these blade banners to a different showing every weekend, if not every day. The inclusion of a carrying bag with the purchase of these realtor flags makes transporting the unit to and from showings a nearly effortless task. Furthermore, the bag has separate compartments for each piece, ensuring nothing is lost or left behind. 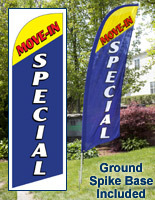 These realtor flags that are pre-printed ship fast and are much more affordable than custom, made-to-order displays. Each banner has a polyester knitted fabric construction specifically engineered for outdoor use. 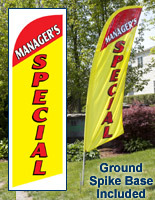 The realtor flags that flutter in the wind are just as durable as units that are more expensive, and just as effective. When compared to yard signage, this display is simply much more visible and effective at drawing in potential renters and lessees. 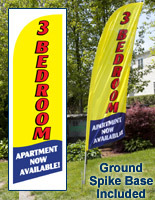 Many realtor flags are overly generic, but this unit ensures passersby know there is a 3 bedroom apartment for rent! Real estate agents, multi-family homeowners and property managers will all find advertising a vacancy with this 8' high feather banner will result in quickly finding a tenant. Durability, portability and an eye-catching design result in these feather banners being one of the most cost effective advertising solutions on the market!